My doctor has no idea why I went into premature labor two months early. And it's incredibly easy to blame myself. Should I have carried all those groceries into the house? Did I overdo it walking too much the week before? When I spent all that time outside and got eaten by mosquitoes... could that have done it? Or was it just me? I mean, my body hasn't exactly been cooperative in the past- four years of infertility have had a big effect on the way I view my body and it's capabilities. Ina Gaskin coined the phrase, "Your body is not a lemon," but I'm pretty sure mine is. And now I feel like my body has failed my baby, too. Watching my little guy struggle is hard enough, but feeling like my body did this to him makes it that much harder. My husband has been so supportive and encouraging, making sure I hear that sometimes these things just happen... but there's still that underlying guilt that I have to work through. 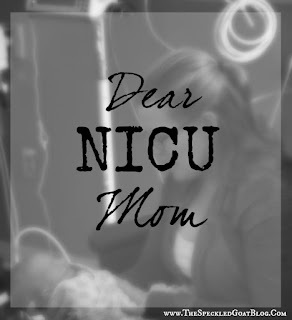 I understand the need for community and support in the NICU. I get it. 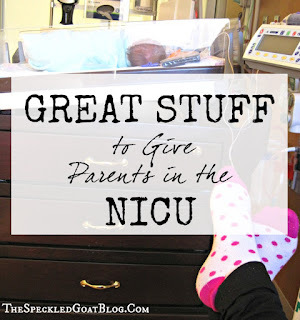 And I've really enjoyed making some new friends who "get" the NICU experience because they're doing it, too. But at the same time, I don't want to make any new friends. I feel pretty done with that sometimes. The two women I've spent the most time getting to know? They're gone. Their babies were discharged and are now at home, adjusting to life as a family without the monitors and nurses. And I'm so happy for them, but I'm sad for us. And then there's the other side of the coin. A baby was admitted the other day, just a few rooms down from ours. All of the sudden, there were seven nurses and the doctor crowding around the little incubator, lots of big machines that I'd never seen before, and several family members standing silent and wide-eyed in the hallway. The next morning, the room was empty. I am not in an emotional place where I can identify with that poor grieving family right now. I can't allow the possibility of tragedy to come into my mind- I struggle with enough fear as it is. I'm sorry I won't meet the parents of every little one here, but at the same time, I'm not. I so want to go home... but I'm also terrified to go home. The NICU feels somewhat safe. There are lots of monitors and a ton (A TON) of people who know what to do if something goes wrong. But at home? How will I know if the baby's oxygen level dips for thirty seconds? What if he forgets how to eat, or how to breathe? What if he gets sick and I don't realize it? And less scary- we'll have to do the 3 am diaper changes and feedings ourselves! There won't be a nice nurse to come in and take care of it while I sleep. It'll be all me and my husband. By ourselves. Like real parents. Yikes. But at the same time, I'm so looking forward to going home! Complicated emotions. outside observer. Like I'm watching someone else's kid. Like he belongs to the nurses and medical staff more than he belongs to me. I think part of it is the shock of him arriving early- I missed out on two months of bonding and getting ready emotionally and mentally for him to be born. 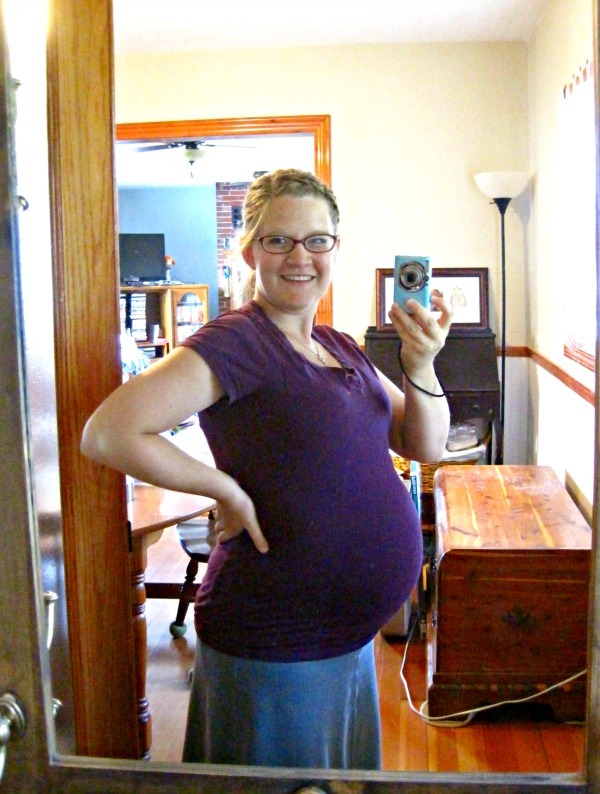 I simply wasn't ready quite yet to meet my baby. But I think the cords and wires and monitors make things even more challenging. I have lots of experience with babies, but this isn't a normal baby. My baby is hooked up to lots of stuff, and even more challenging, he doesn't always react like a "normal" baby reacts. A lot of my infant-care instincts are wrong when it comes to my baby-- and it makes me feel a little like he's a stranger to me. I really thought that when I got pregnant after years of infertility, the jealousy thing would be over. I was wrong. I still struggled with jealousy when I saw pregnancy announcements on Facebook... and it was a strange feeling to be jealous because someone was pregnant even though I was pregnant, myself. And then we had our baby two months early. Many of our loved ones are also having their babies around this same time, and once again, jealousy has reared its ugly head. Pictures of babies in car seats make my stomach drop. I want to take my baby home. Happy families on hospital beds- that's an experience I didn't have, since my baby was immediately flown to a NICU more than an hour away, while I recovered from my emergency c-section. Even a discrete picture of a mom feeding her baby makes me jealous- my little one isn't eating on his own and has a feeding tube down his nose. I don't know that any situation in life will ever be immune to some sort of comparison or jealousy... and I've got to find a way to come to terms with life as it is instead of life as I wanted it to be. 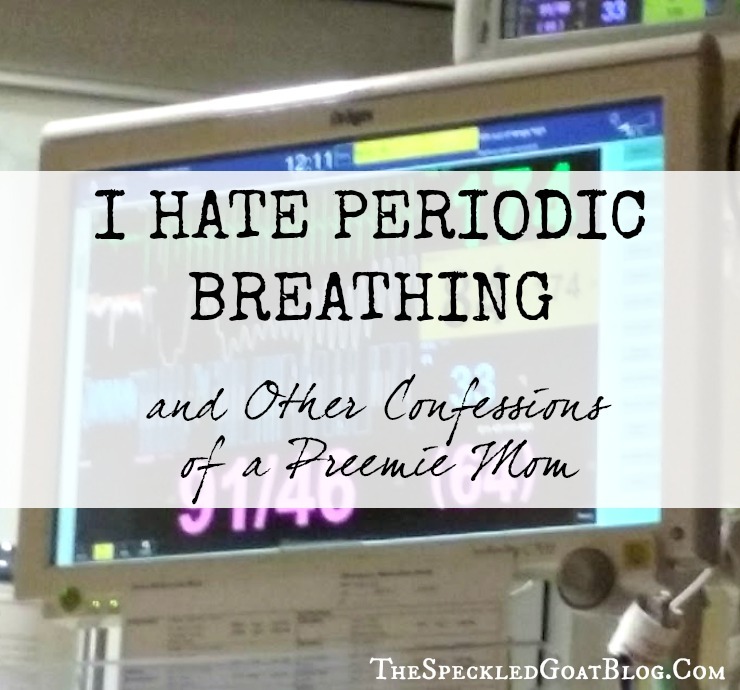 Our little one, like many many preemies, does this thing called periodic breathing. Basically, his little brain is too immature to remember to breathe all the time, so he takes some very inconsistent, slow breaths. Then, when his oxygen level goes down a little, his brain realizes he needs more air and so he breathes quickly to catch up. It goes in a pattern like that--- slow and oxygen drops, fast to catch up, slow and oxygen drops, fast to catch up. ... but I also hate it because I'm selfish. Because at 3 am, when I've finally closed my eyes after yet another pumping session... his monitor will ding. His oxygen levels have dropped, and the alarm goes off for three short dings... and then he's fine, until thirty seconds later when it happens again. And for the love of everything, I just want to sleep. And periodic breathing makes me annoyed at my baby. What kind of mom does that make me? That I want my baby to have enough oxygen because then I can sleep well? Not only am I worried about my baby, sleep deprived, and hormonal, but now I also feel like a terrible parent. I never in a million years expected that this would be the way we welcomed our baby into the world. He's gone through so much already, and he's not even a month old. He's had more than five IV's (one of which took a full two hours of pokes before they found a suitable vein). This was a rough night-- the nurses were having a hard time placing the IV, and our baby just cried and cried. Trevor was doing his best to comfort him. He is constantly harassed by monitor bells and alarms. He's had his blood drawn over and over, had x-rays, feeding tubes pushed through his mouth and nose into his stomach, and has had tape ripped off of his face several times. I know that logically, my baby won't remember it. But I can't help but feel like all this could definitely effect him. And that's not considering the potential for developmental delays or the risks that come along with a premature immune system, a premature sensory system, and premature lungs. And even if it doesn't effect my little one, I know that this very well could effect me. The risk of postpartum depression is much higher for families with NICU babies... and most of the time, it doesn't hit until the baby goes home. 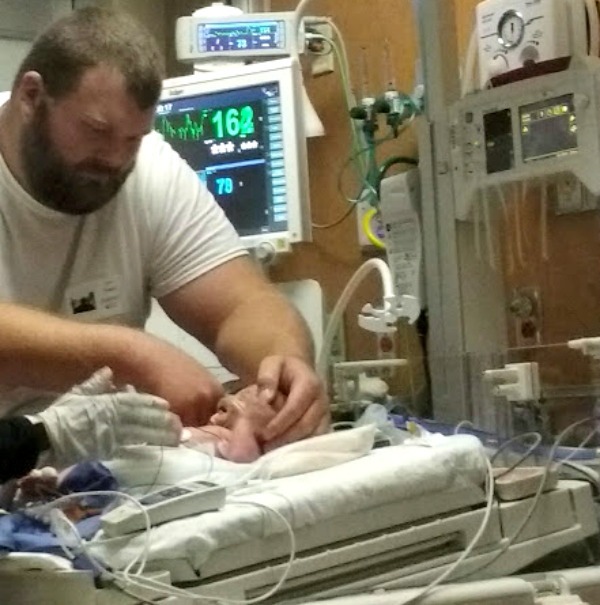 Post-traumatic stress disorder is common in NICU families, too. What about my parenting? I can totally see myself becoming a pushover parent because I want to give this baby everything and anything to make him happy after all the crud he's been through already. I already think I've become much more paranoid about germs- and I'm sure it will only get worse once we're back in the big wide world. I know that there will be many blessings that come out of this experience. I know that God is so very here and He's kept us so protected already. The hard times are here to teach us and grow us and shape us into the people God wants us to be... and also to make the good times sweeter. I may never fully understand why this happened, but I know that ultimately, we'll be okay and come out the other side a little more like Him. This is so honest, and raw, and beautiful. I feel honored to have read this and hear your heart. Prayers for you and your family. Beautiful Ally! You will look back on these words for many years! I encourage you to continue journaling about your experience. All three of my sons were preemies. Our youngest was born at 26 weeks in 1989. He was 1 lb 14 oz and dropped down to 1 lb 9 oz. He is now a strong and healthy 28 year old! God is good - Amen! I look back on the memories and regret I was not journaling at the time. I was a very young mother and I had a 9 month old and a 7 year old when he was born. Life was busy! I feel your words when you shared about the pricks and the prods and the adjustments. It took weeks before our son could wear a diaper. 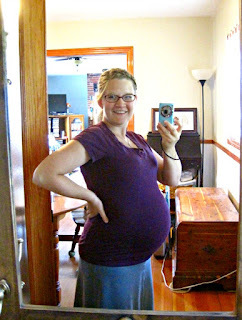 Weeks before I could hold him in my arms. And, I too hated to leave him. It was a trying time but God was there through all of it. And, later, the check ups, tests, developmental delays, growth delays...but God was there and He is still there. If you need to reach out or talk to someone who has been there, do not hesitate. I'll be keeping you and your precious family in my prayers.